Washington (CNN) – In the heat of the political debate over the debt ceiling last week, Rep. Doug Lamborn (R-Colorado) may have crossed the line when he said that being associated with President Obama would be similar to touching a "tar baby". "Even if some people say, well the Republicans should have done this or they should have done that, they will hold the president responsible," said Lamborn said Friday during an interview on a Denver radio station. "Now I don't want to even have to be associated with him. It's like touching a tar baby and you get, you get it, you know… you are stuck and you are part of the problem now and you can't get away." Wow...next you'll be telling me that water's wet! As a middle-aged African- Am. Male, I refused to be angry or call the Congressman a name in return. He said what he said and I accept the way he truly meant the term. It is so sad that we cannot have political debates or opinions without using race as apart of the debate. Is he a racist? I don't know that for a fact. Only he and God knows what is actually in his heart. Yes, don't think Americans aren't aware of what Republicans think of the President! This is 1 of the major problems we (& he) have to deal with & the reason there are still so many unresolved issues! They oppose him at every turn, & refuse to co-operate & compromise! Their bi.got.ry & greed is more important to them than taking care of what the country needs & what their constituents are asking for! One of their favorite catch phrases is to say"the American people..." but we don't want our kids education cut or our parents SS & Medicare!Trust me, we are not volunteering that $$, they are taking it from us! Aren't ther laws against politicians behaving this way!?? Seriously?? There is no better analogy Lamborn could have planned to use than this one?? Is Lamborn part of the Tea Party group?? This is what is fundamentally wrong with the US of A these days!! There is a racial divide that is more deep rooted than conservative v liberal! Civil unrest is next and politicians like Lamborn are at the base of it! This character is an ignorant racist and should resign. Disgusting on every imaginable level. Why is this racist in office? 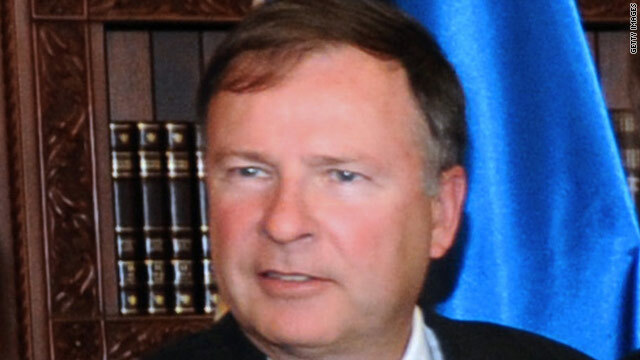 How could a jerk like this Lamborn ever be elected to Congress? how is it a politician is forced to resign for sexting yet racist comments can get an apology and no one even thinking about resignation. this guy is a creep and should be kicked out of office. he confirms that the repubs don"t want to deal with Obama just because he is a black man.nobody really wants to talk about it but it is true. think about it. when they turn against their own idea like health care reform just because he was for it.and the list gos on. the more he trieds to work with them the more they are aginst him. what else is it. we have a congress and a senate yet he is the only one the gets blamed.but guess what he takes it like a MAN! thats more then I can say for the repubs and dems. The repug needs to be impeached for his racist comments! Enough with this ridiculous disrespect for the President! America how can you tolerate this overt racism towards the president? It does not cross the line when a politician knows when the ship is sinking and does not want to be stuck with the loser! Obama, the Democrats in the house and the 23 Senators up for election in 2012 better understand their jobs are on the line, we are watching how they vote, they will be replaced. We are at depression levels of employment in America our government debt is at crisis levels. This man is representitive of the GOP in all ways. The GOP since Obama has become our president has been on a man killing mission, Destroy Barrack Obama, make him a one term president, if he wants it we are against it. The have made this all out in the open along with attacks and lies about teachers, policemen, students, seniors, infants, women, illegal immigrants. With our president it has always had a racial undertone. Does anyone really think they would attack any other president with the same viciousness they have against our Black President? This is just another slip of the tongue that they would like us to forget but we wont, we cant. We have watched a coordinated effort to take this government hostage by the Tea Party which might as well be the KKK without the sheet. This man should resign but he wont because this is what he believes his party is about and "Whoops I didn't mean that, sorry Pres" then go back to his racist ways. This should be shown to all and shouted at the roof tops. WE have already seen what they are and many have buyers remorse, many are sorry they didn't vote last time, we have to stand up against this assault on democracy. Vote your conscience in 2012. More racism from the extreme rightwing teatards. Lets hope saner less racist GOBPbaggers condemn his words. Yeah yeah we all knew what you meant. I guess the United States is still not ready for a black president! Why are the Republicans filled with so much hatred? Whatever happened to taking care of Americans first? Looks like time is going back to the days where racism was like saying hello and every white man was for himself. Such disrespect towards our president! Disgusting!!! Well Rep Doug lamborn.. Your gonna b "stuck" with him 4 more years. One suggestions, learn to show some respect for the commander in chief, our president! This is what is really frustrating, their ability to be name calling, yet can't seem to get anything done! Oh come on, man, racism is SOOOOooooooo last century - get over it. And what do you call George W. Bush who is responsible for the deaths of thousands of innocent American soldiers over an illegitimate Iraqi war? What do you call GWB who lied to the American people about bogus and nonexistent WMD's in Iraq, a president who is also responsible for the worst economic crisis in America since the Great Depression and our current state of affairs? And you do you call yourself who supported GWB and continue to support the GOP and a Tea Party who's only interest is to divide and return America to the Jim Crow era of the 1950's? Mr. Lamborn, America would have been a better place if racist scumbags like you were never born at all. A matter of fact, America would be a better place if you and the GOP and their Tea Party were to get together and drink Cool-Aid. Or better yet, you should play Russian Roulette until the chamber is empty.